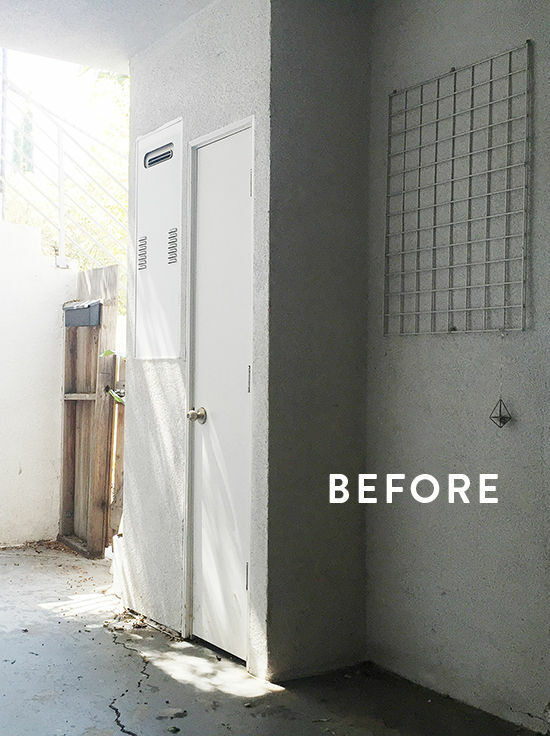 D E S I G N L O V E F E S T » MY PATIO MAKEOVER! one of my FAVORITE things to do is entertain. 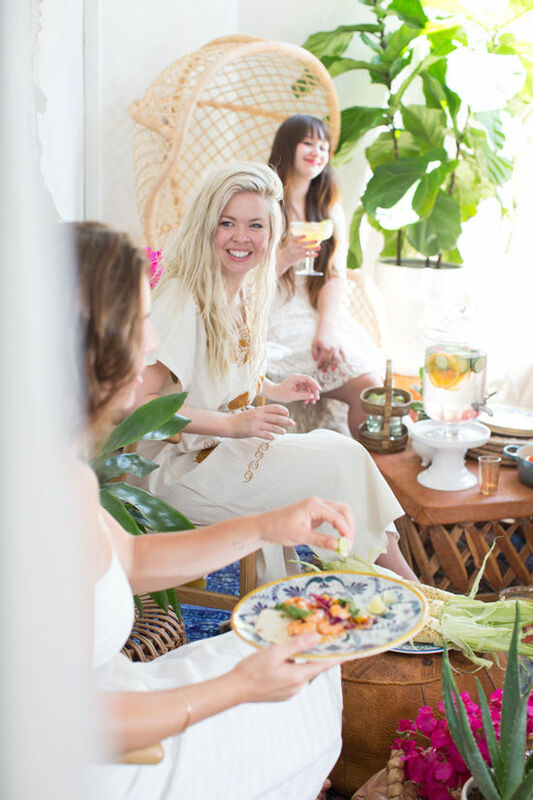 there’s not much that makes me happier than a night with friends laughing and eating good food together. we have been gathering quite a bit now that the summer weather is perfect in the evenings, rotating who’s house we’re eating at. 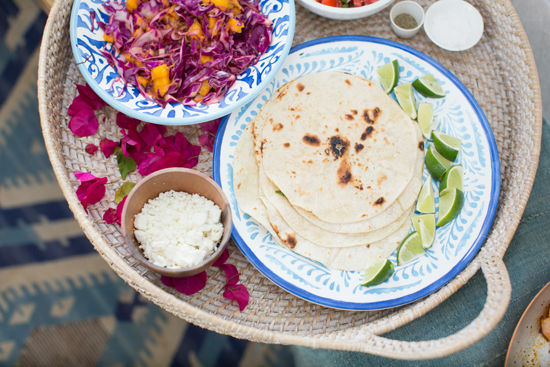 jesse’s roof, victoria’s backyard, jen’s patio…it’s been so nice to eat outside! 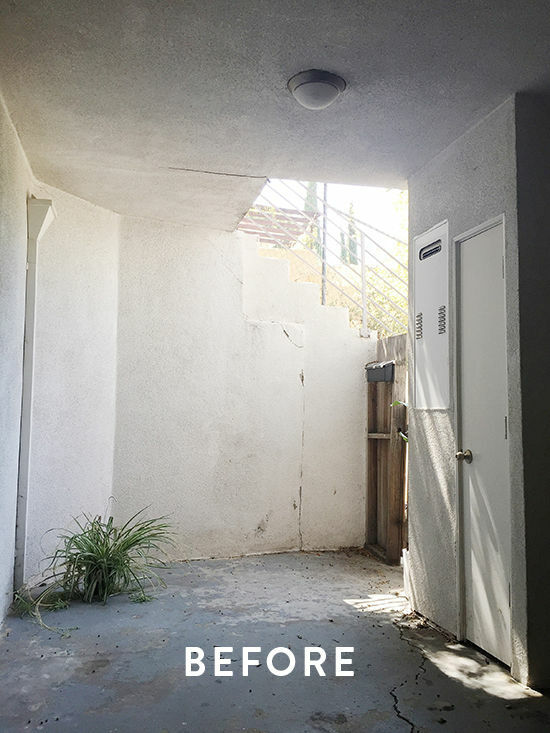 i’ve been wanting to make my awkward long hallway in the back of my place into something that felt cozy and almost like an extension of my home. considering it’s mostly covered it almost does feel like an extra room now! 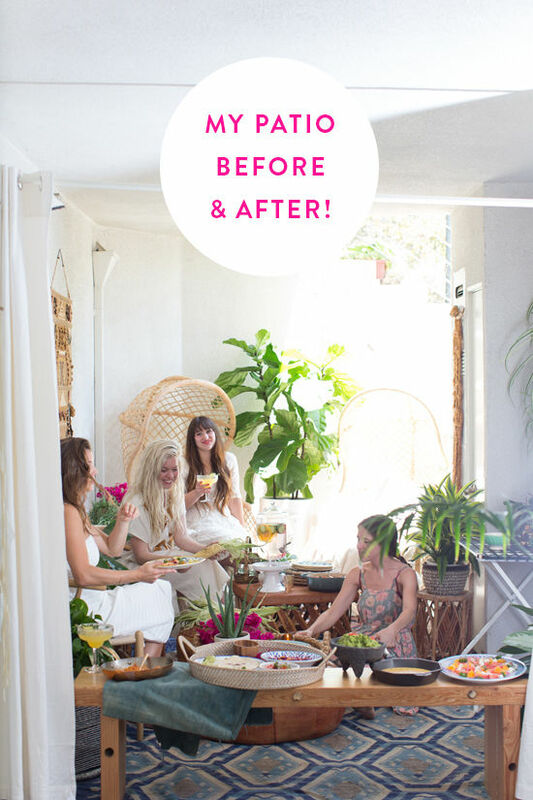 here’s the before and after and the little party we threw with williams-sonoma and visa checkout to celebrate. 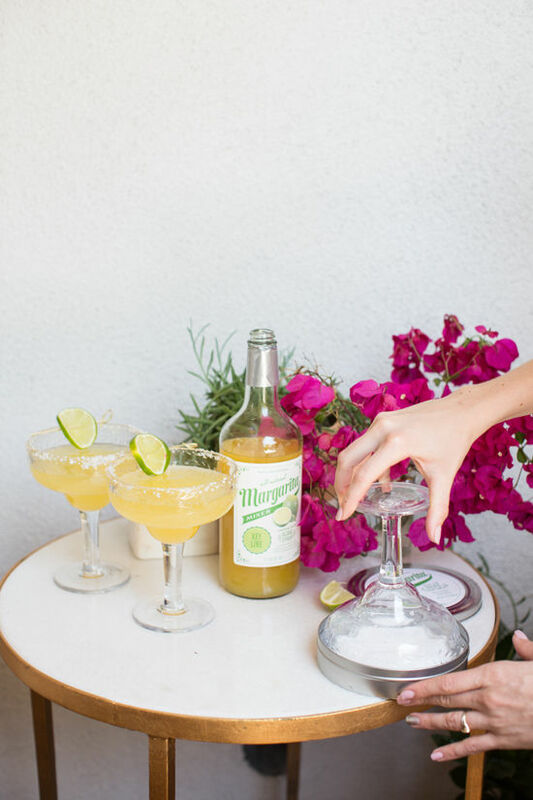 visa created an easy way to safely navigate checkout from any devices with just a few clicks so that you can spend less time online and more time hanging out on your patio drinking margaritas (which is always a win in my book)! 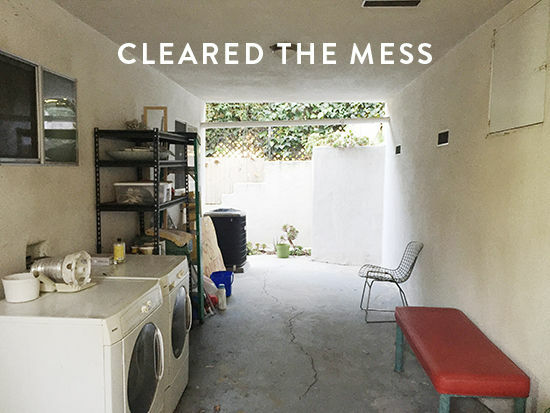 first off, my washer and dryer and a whole bunch of junk i never use lives back there, so the first step was to declutter. because the hallway is so long, i wanted to focus on only half of it for now (and maybe put a table on that other side eventually and build a cabinet for my washer and dryer) we hung a compression rod and a few of my favorite white linen curtains to create a separation, but also make it easy to access the other side. now it’s not a huge space, but plenty big to have 4-6 friends over. we scrubbed the floors the best we could, and laid down a bunch of vintage rugs that overlap each other and create a beautiful array of color. my friend jay is amazing at collecting vintage, finding the best gems on craigslist and at the flea market. i knew he would be the perfect fit to help me style up the space. 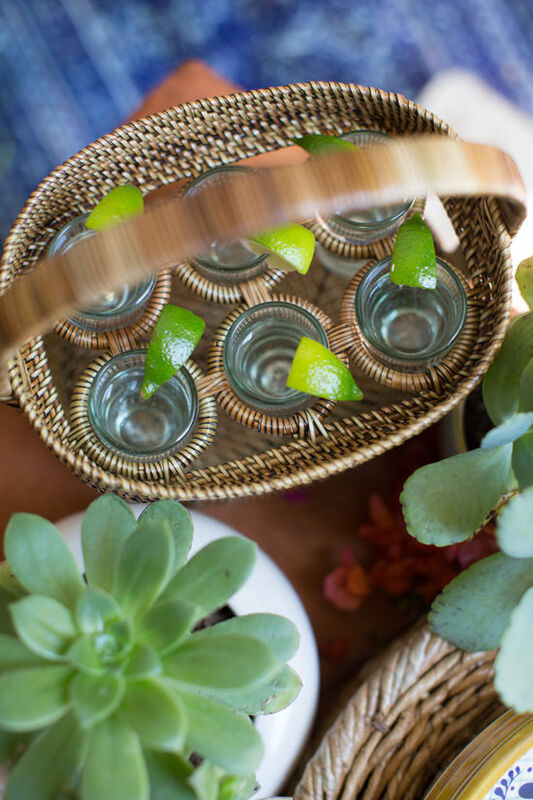 for our party we used all of these amazing outdoor entertaining elements from williams-sonoma. their cantina collection was great for the colofun theme we had going on. i seriously can’t believe the transformation back here! i smile every time i walk out the door. i’ve been having my morning coffee and taking some time for myself to think out here and it has been really nice. 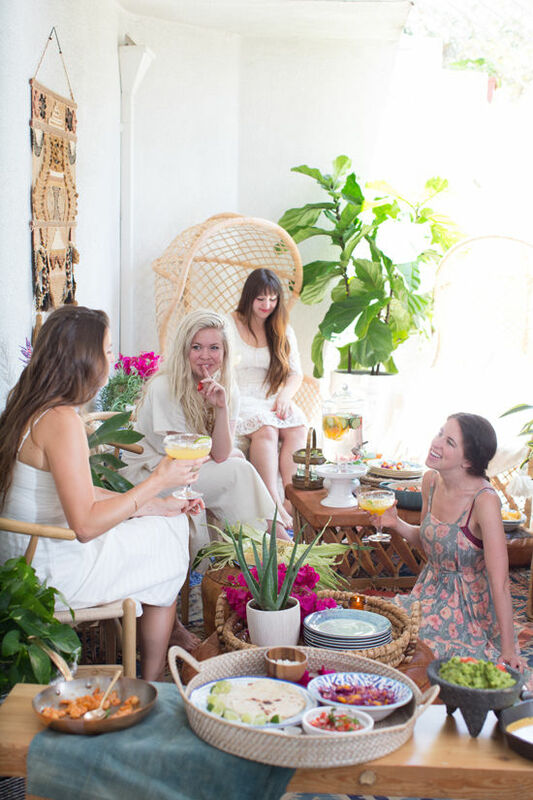 we set up the little afternoon party outside and invited a few friends over for lunch. we used the benches, low tables, and poufs to display the food, and everyone could just sit and eat wherever they wanted to. 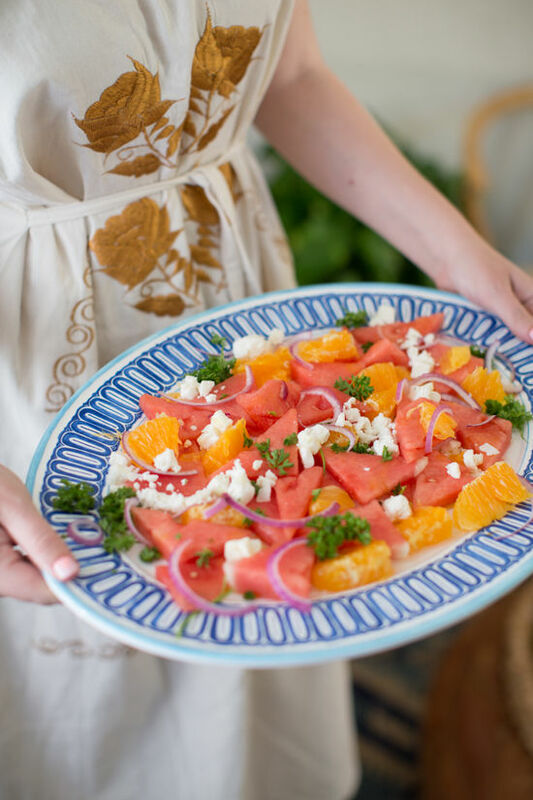 we wanted to keep everything fresh and colorful and we used an assortment of playfully patterned dishes from williams sonoma to set the stage. and how about that le creuset? i’m in love with that ocean color. 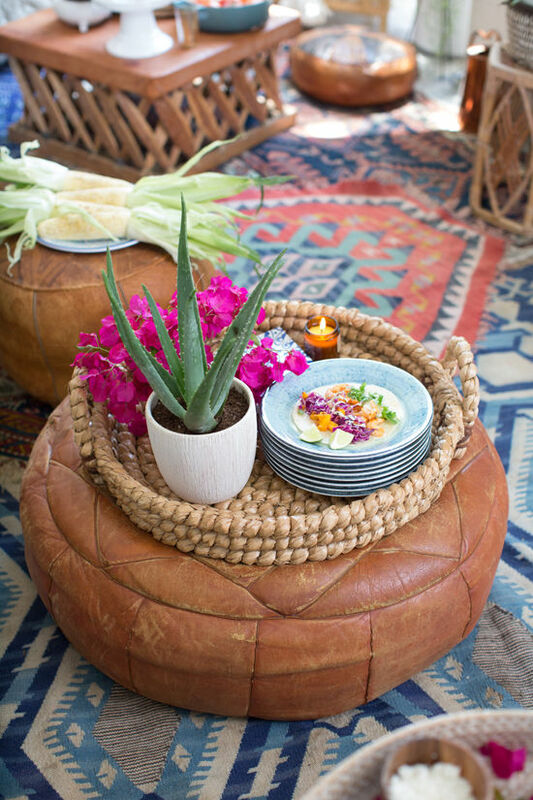 shop these items: large woven tray on pouf, set of blue dinner plates, woven chargers for plates, blue and yellow plates, ocean le creuset dutch oven with tomatoes, and blue paper napkins. and look at this cute shot glass carrier! 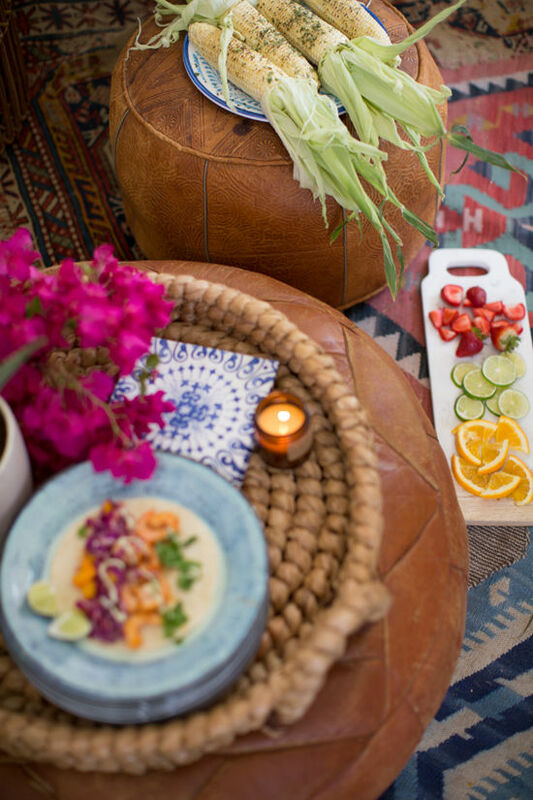 we made shrimp tacos, fresh guacamole, queso, watermelon orange & feta salad, mango slaw, and corn on the cob. we also used a sriracha rub (a little goes a long way, it’s spicy!) on the shrimp and pan tossed it in a little olive oil, salt and pepper. if you’re looking for more recipes you can check out this video that has some easy options for your next party. 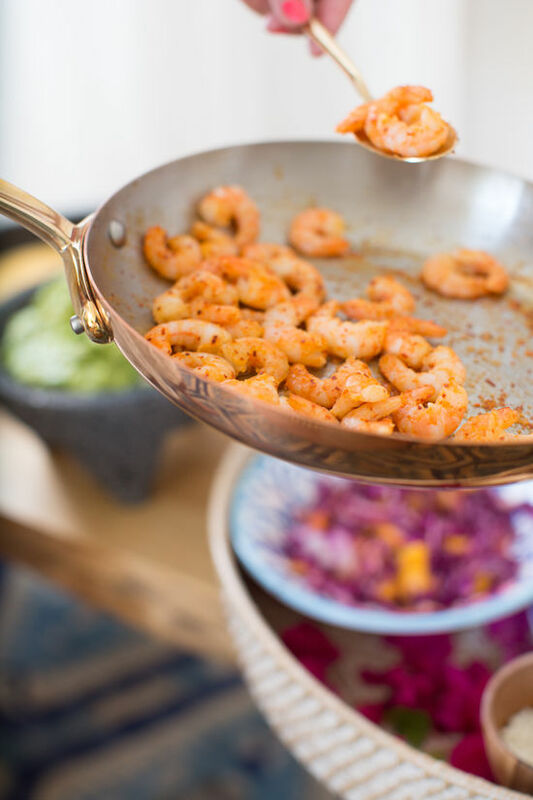 shop these items: copper frying pan with shrimp, large round woven tray, guacamole mortar and pestle, and the cast iron fry pan. the inclusion of plants was an ESSENTIAL part to the makeover. 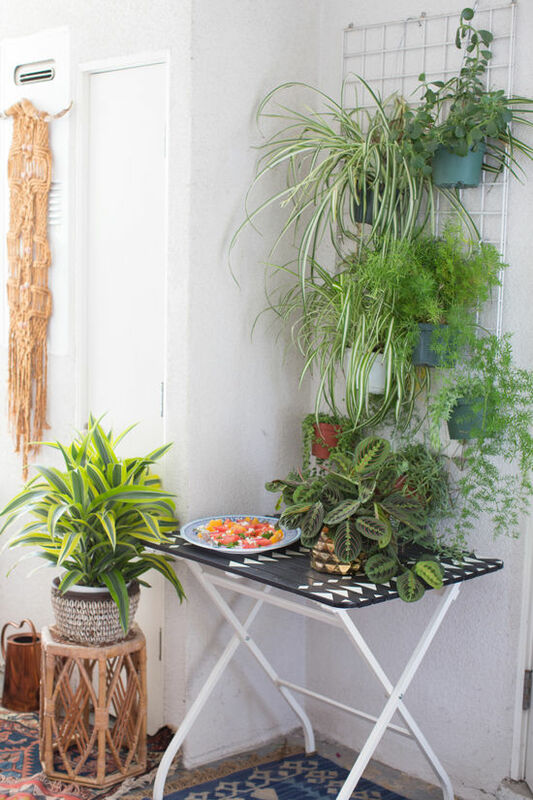 i had this rack already hanging on the patio (i assume it’s for hanging clothes) but figured it would be perfect to hang a bunch of plants on to liven up the space. this instantly made the area 10x better! have you ever used a salt plate for cooking? they are SO cool. 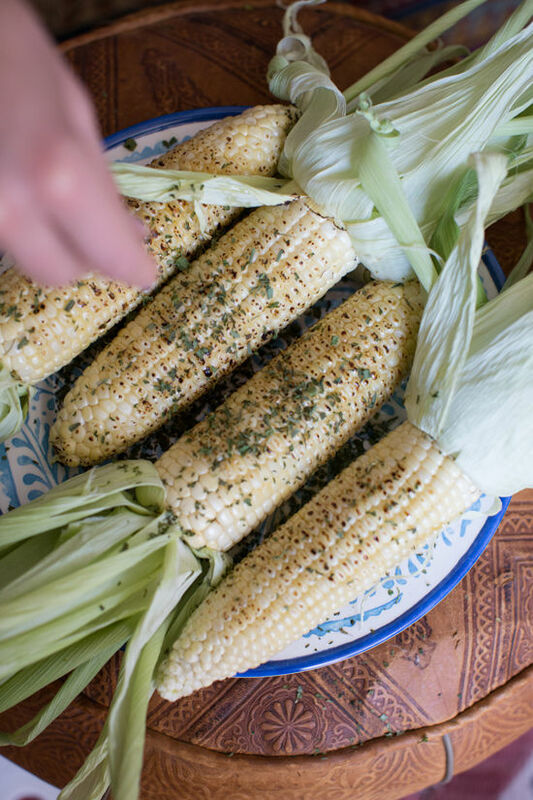 use them in the oven, on the grill, or just for presentation. 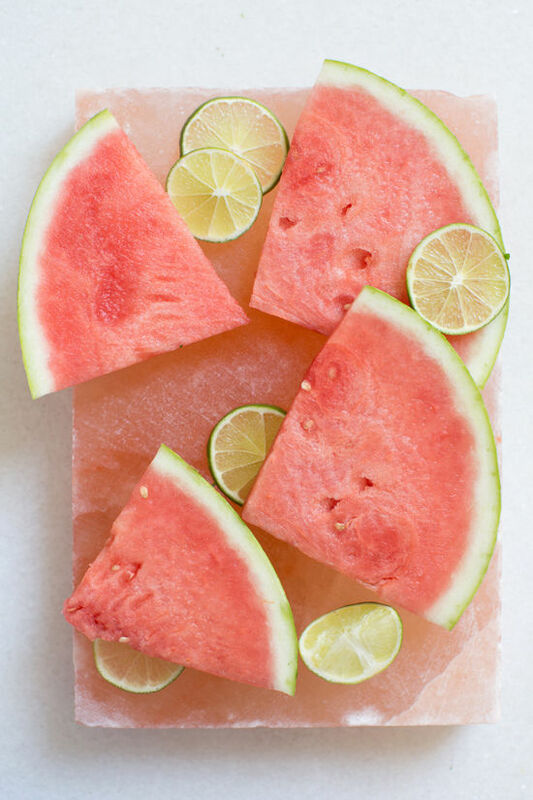 i like my watermelon a little salty with lime on top, do you? 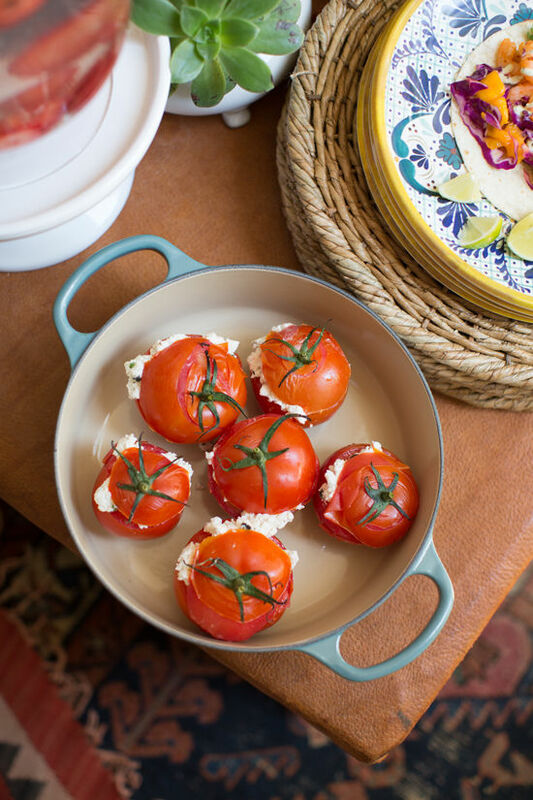 those blue platters are actually melamine, so they are super light and won’t break easily! 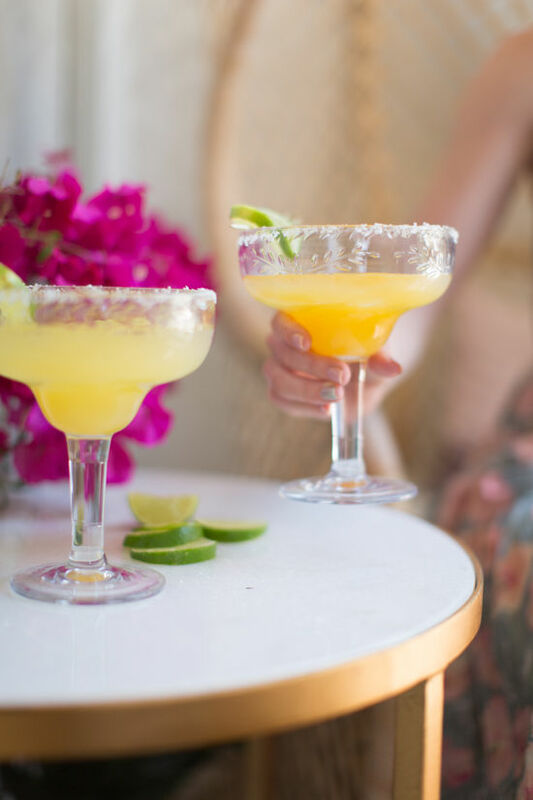 i splurged a little on the diet and tried half of a margarita. 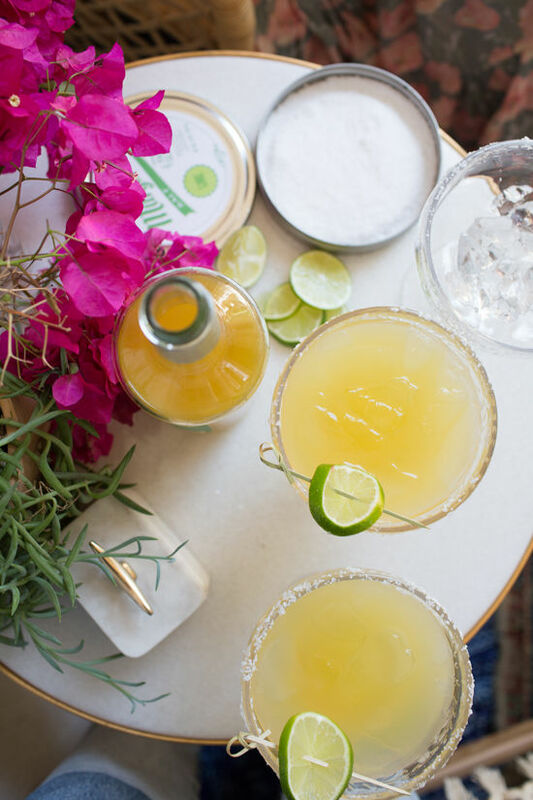 just add tequila to these all-natural mixers (and try the skinny version.) and dip the glasses in this salt. 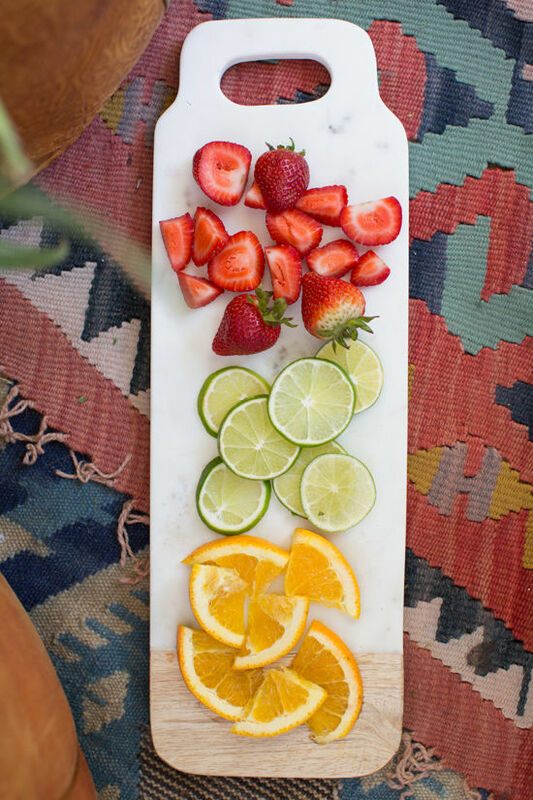 lay out extra garnish choices on this pretty marble and wood cheese board and allow people to dress their tacos as they please. 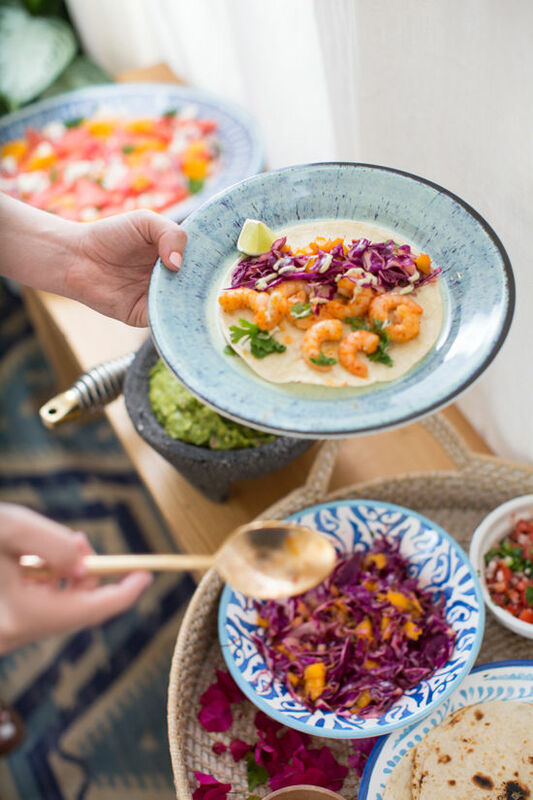 we made a healthy cabbage slaw for our shrimp tacos by thinly slicing red cabbage, adding mango, lime and a little salt. i always like buffet style, where people can pick and choose their items and portions! 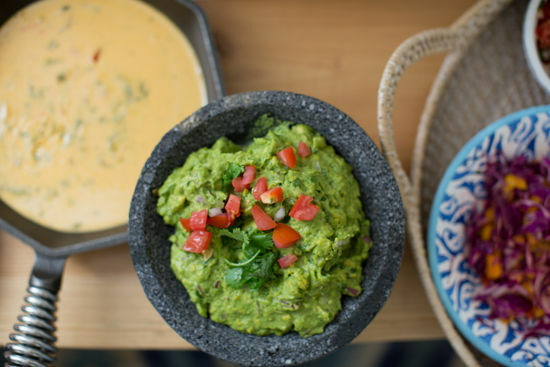 always make double the guacamole because it goes so fast, everyone’s favorite. fusion water is so pretty to serve, we used strawberry, cucumber and orange. 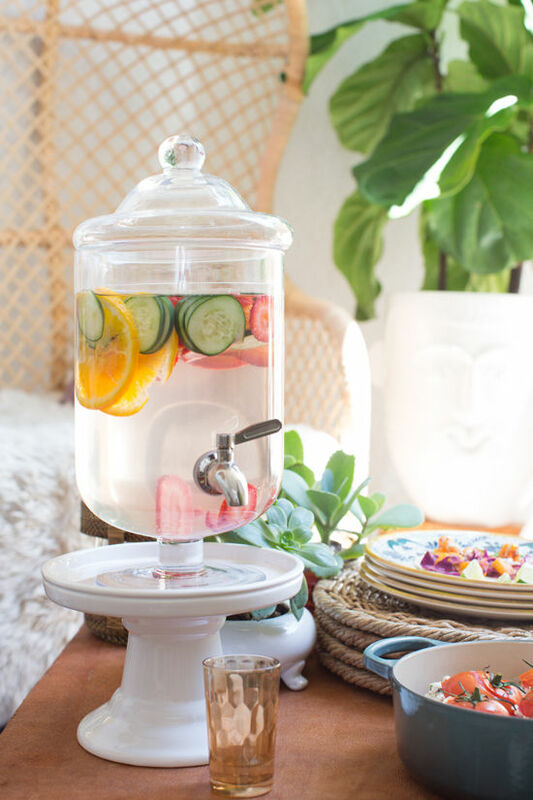 super simple and makes water a little more fun for those of us who are going light on the alcohol these days. 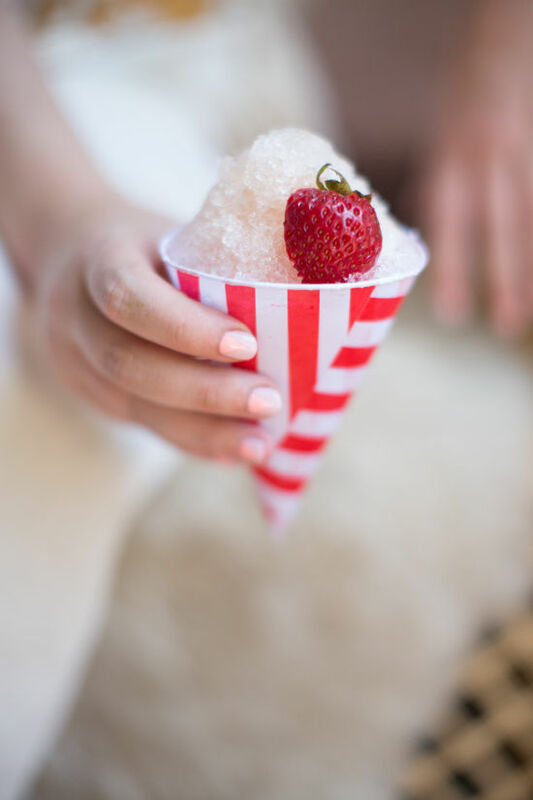 this snow cone machine & party cups are a fun summer addition, and so easy to make. 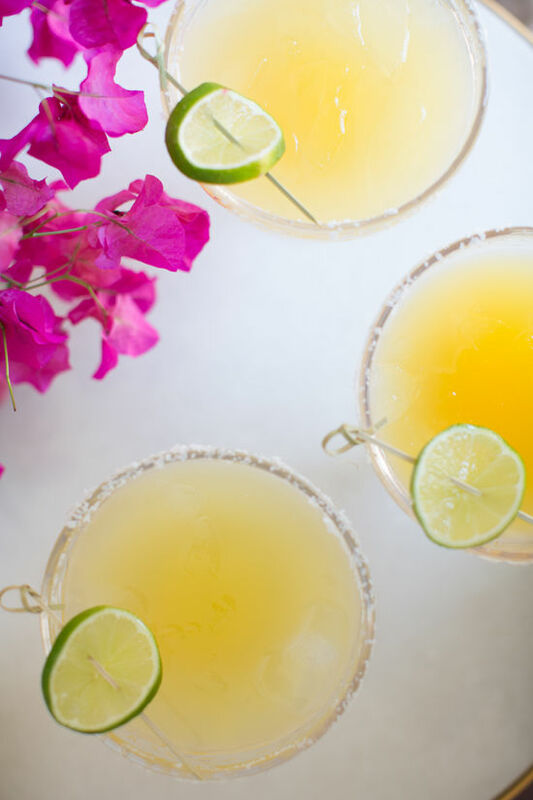 you could make the boozy by mixing the syrup with tequila or rum before drizzling on top. 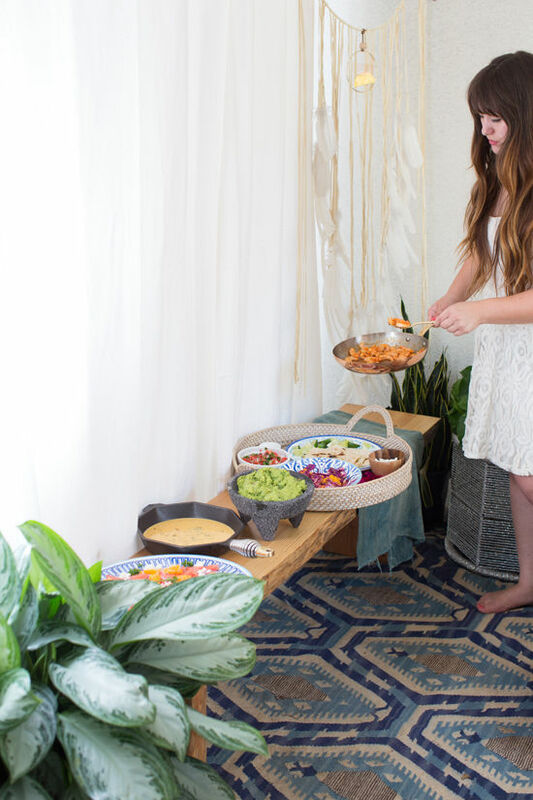 if you’re wanting to throw your own outdoor party this summer you should enter the visa checkout sweepstakes* for a chance to win $5000 to williams-sonoma! they’re also offering a discount on your next order over $100 for giving it a try. I am OBSESSED. This is just beyond beautiful. You have the best taste in home decor!!! Love this transformation! 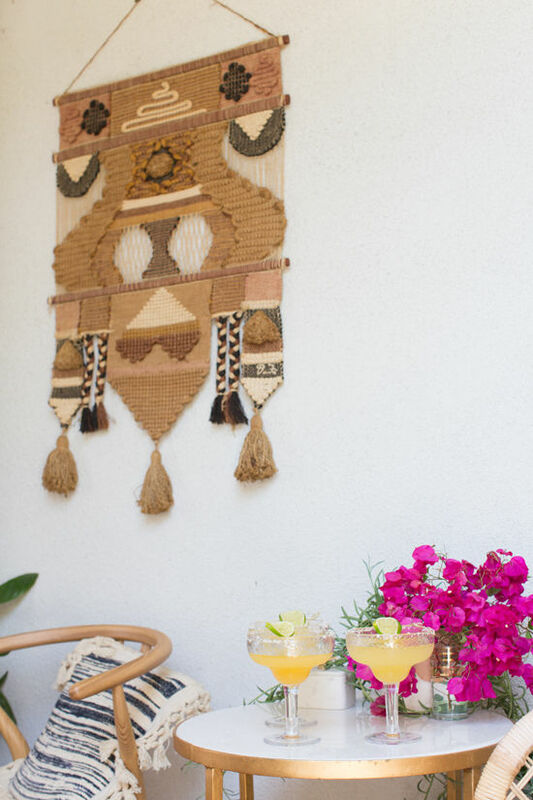 I realllly need to know where those woven wall hangings are from though. Vintage?? I’ve been looking for something similar for my moroccan style bathroom!!! This looks amazing! I would want to hang out here all the time. It’s so great that it’s covered, so you are outside but shaded which will be nice when it starts to really heat up this summer. I would love for someone to address how they keep spiders away. 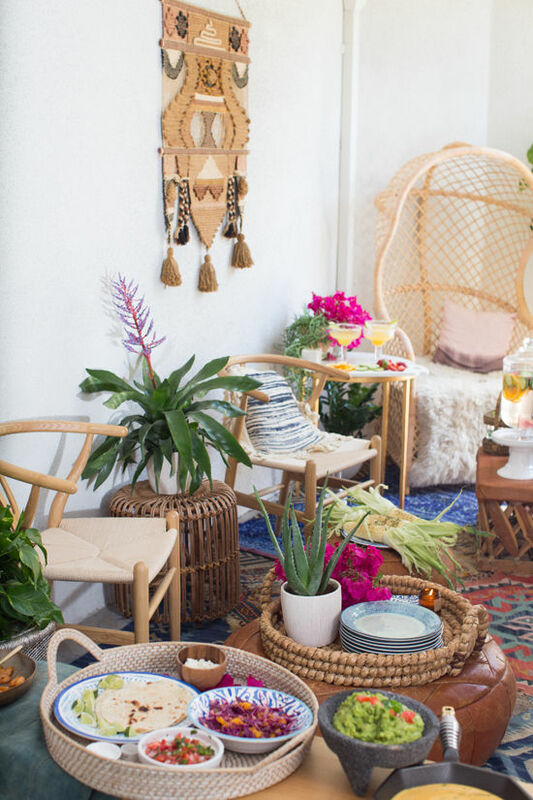 Every time we move, I set up our patio all cute with plans of entertaining, and then I end up never going out there because spideys always be settin’ up shop in my chair cushions, and my outdoor rugs always get algae-fied. Woah! Such a transformation! Very impressive. It looks so colorful and bright and happy now! Way to go! 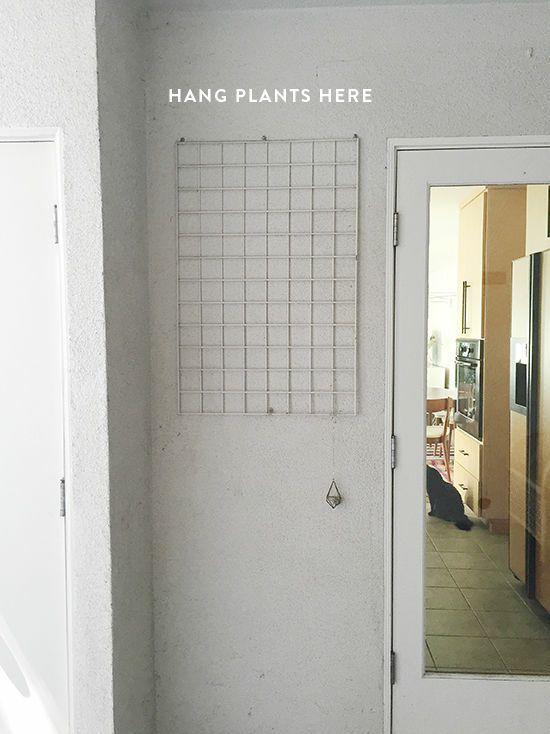 I absolutely adore this makeover, especially the plant hanger. I would spend hours out here. Thanks for sharing these ideas! 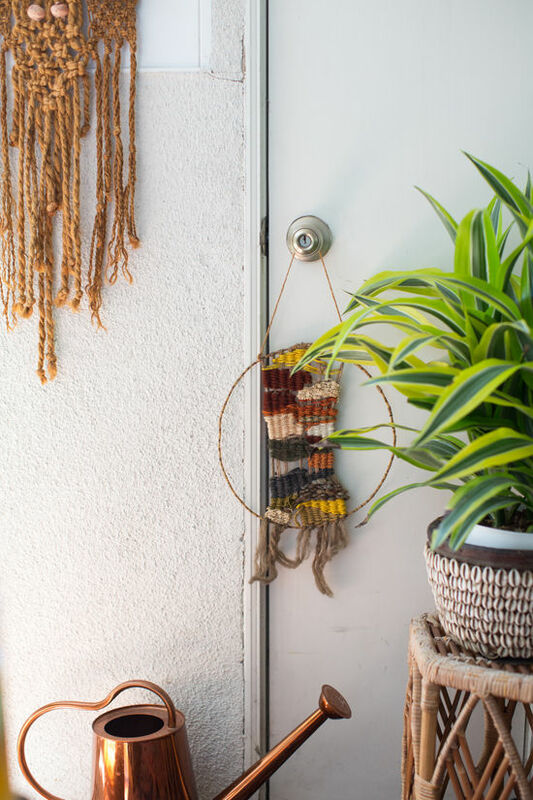 Please, please, please share where the white planter with the face is from!! Love, love, love!! This is so pretty I don’t even have words to describe it. Wow, Bri. I’m being modest in saying that the styling is perfection. I can’t believe how different the before and after is. This makes me feel so ready to take on my own home! i love this, everything looks so cozy and beautiful! 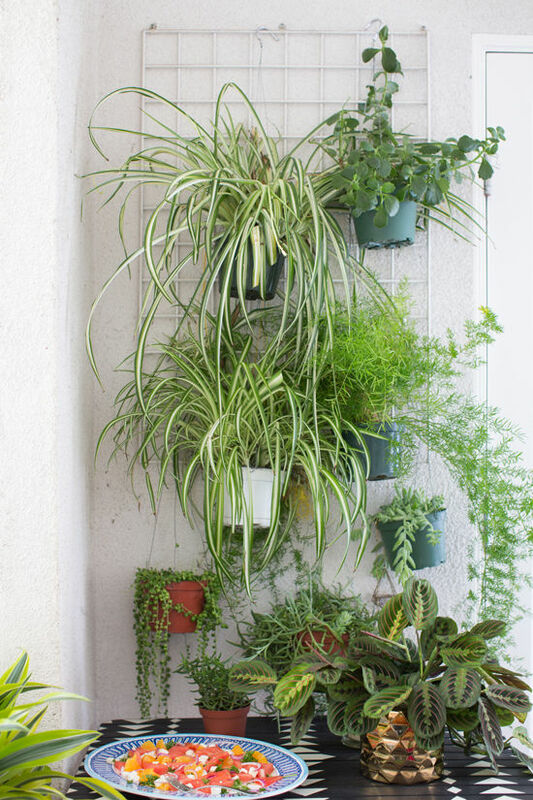 I especially love the plant wall – I need to do that at my place! What a transformation! Shows what you can create in a small space, with a big imagination. Love it. such a great makeover! 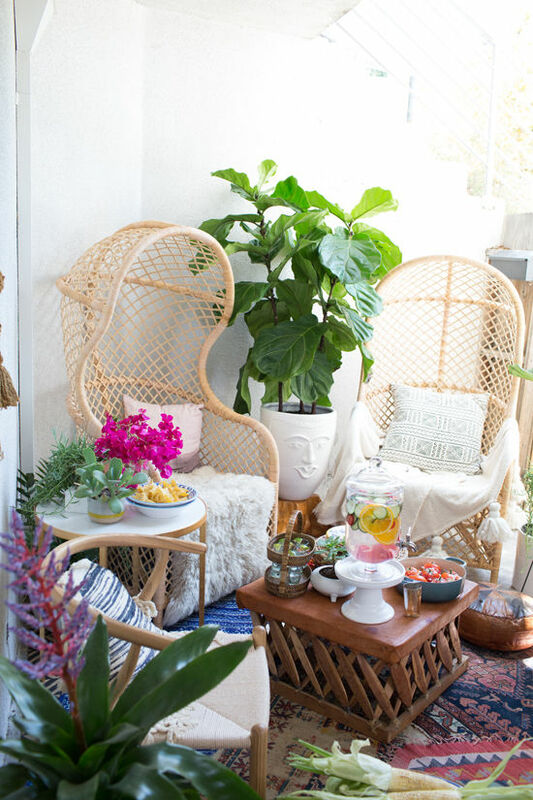 It’s amazing what a huge change plants add to any space. 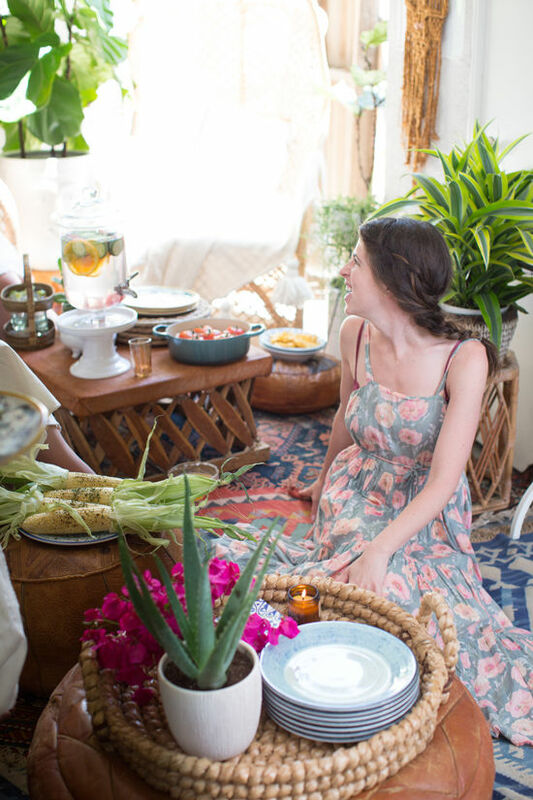 I love the marrakesh vibe of the whole thing. I love this! 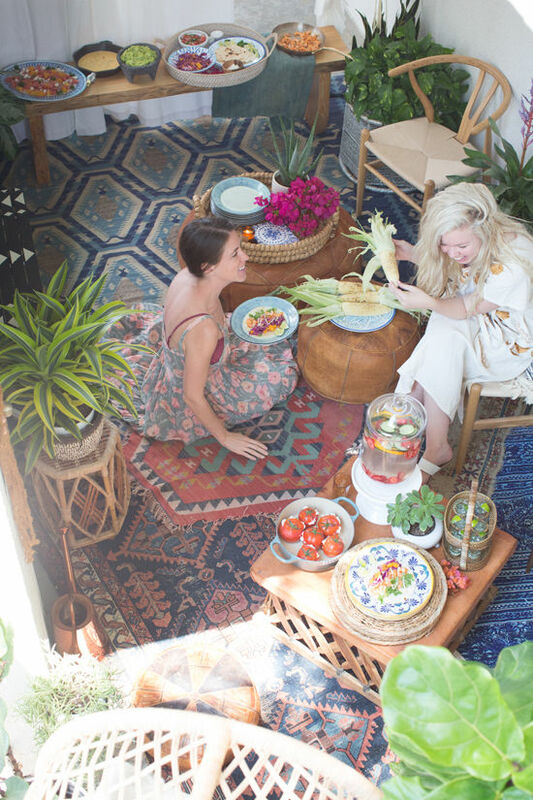 Where do your rugs come from? I love the stunning colours incorporated into these pictures! They’re so bright and bold. Ooh! 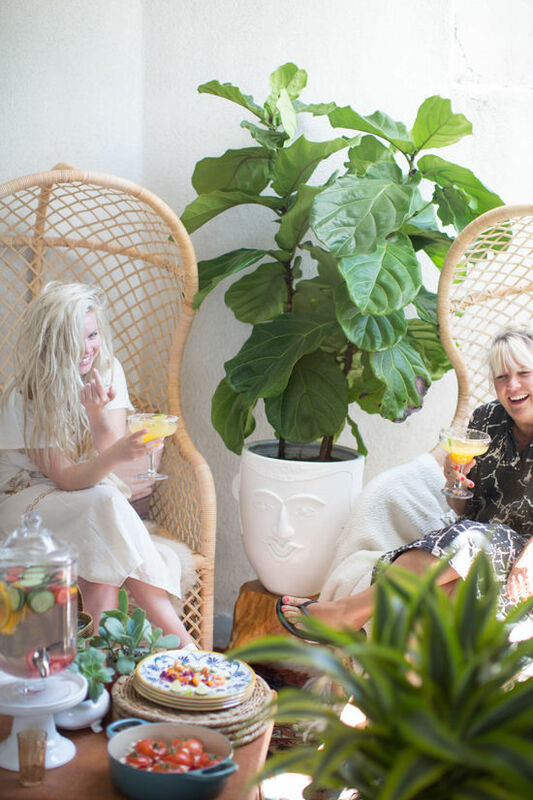 Not only is your new patio absolutely glam, you also gave me an idea for the PERFECT gift for my partner! 😉 Thank you for always being an inspiration, DLF! I like to cover unsightly but necessary wall units with yarn wall hangings/woven tapestries as well; it doesn’t alter the function but hides them nicely. 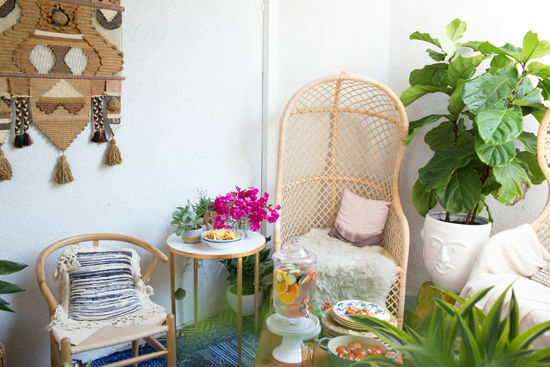 Showed this to my husband as an inspiration for our own patio, and he said “There’s no room to set your plate on that patio! Every surface is covered with stuff. That’s not comfy. I cannot imagine myself there awkwardly holding my plate because there’s no place to set my stuff. Also, why is half of the girl’s (he meant Bri) face covered with her hair for all the pictures?” Sigh. 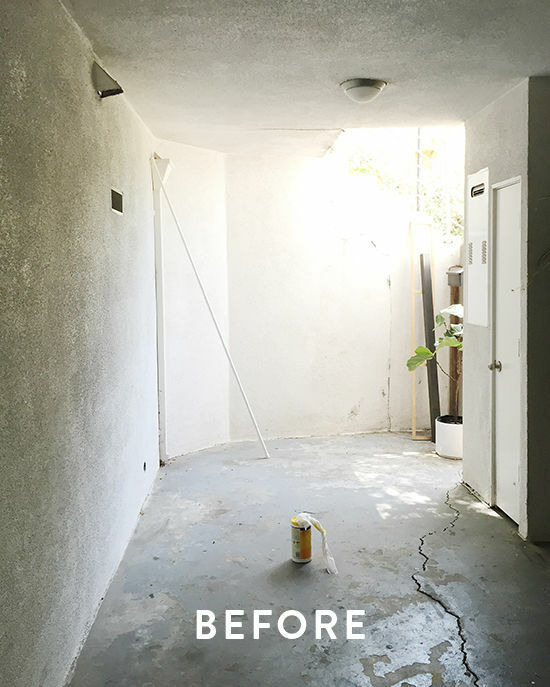 God I love before/afters – this is a great one! Love the style in all if these beautiful photos. 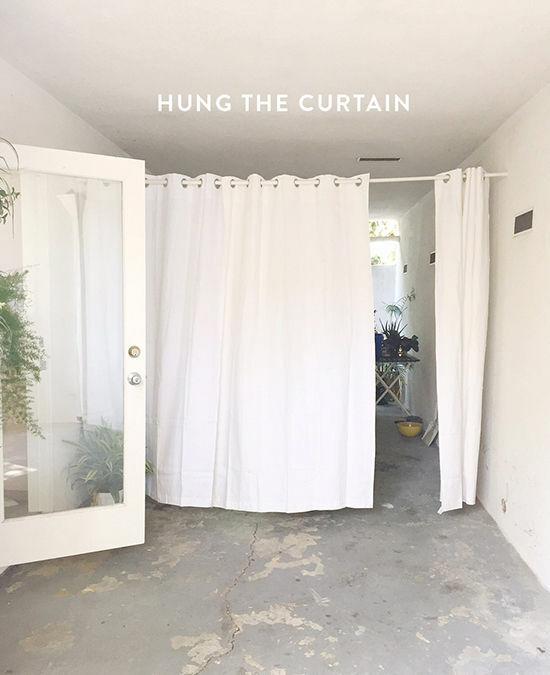 You took an awfully dingy area and turned it into such an awesome space. I’m in love! my presentation subject matter, which i am going to deliver in university. 6 and 6PLUS as well. Right after open, May I improve to new iOS without any issue?
! !. Goto jailbreakwizz.com.! and do it at no cost ! !. This is still the only internet site well worth planning to ! Try this service provider find out mobile 4 (Veronica). Completely Factory Open iphone 4 6 or 6 Additionally so it can be used on other Networks. free by using jailbreakwizz.com You do not have anything to lose ! consider simply how a lot time I had spent for this information! Thanks! the threat of reminiscence associated troubles. This includes mathematicians who have used computer simulations to try to gain an edge on the game. T or F are used to give you a top-view of the object, or drop it level with terrain (floor). someone to whom you were taking recently. I wish all the properties i worked on looked this pretty.